When it comes to the summer, our beauty requirements change to suit the temperature, the fluctuation in humidity and hopefully the introduction of a lot more sunshine in our lives! 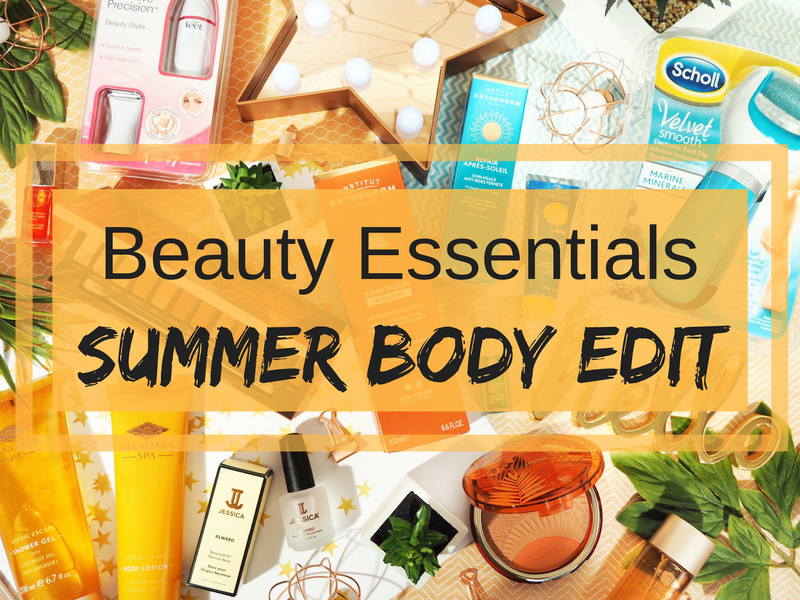 Whether it’s our need for make-up products that last longer under the glare of the holiday sunshine, or the need for a constant and reliable source of sun protection, there’s just so much to change up in your beauty regime come the summer. Every summer body needs protection from the exposure to the suns rays. And trust me, I can speak first hand for what happens when you don’t thoroughly use a good sun cream or spray – this year I burnt my feet so badly that I couldn’t walk for days and my feet still aren’t the same colour! So my very first Summer Body Essential has to be a good sun protection routine. I’m a big fan of the Bioderma and Institut Esthederm ranges because they offer more than a lot of other products I’ve tried. The Bioderma Dry Oil with 30 SPF offers high protection but it also works with the skin’s natural ability to tan, meaning bronzed skin is on the cards in no time. I get a bit daunted just using oils, so I like to combine with the Institut Esthederm Adaptasun Protective Body Lotion because it works like a moisturiser and also provides protection that’s high enough for sensitive skin. Plus the Bioderma Cream+ Stick is a great little essential for the handbag – 50 SPF and it works great for touching up my nose, my scalp and those smaller areas while on-the-go. Summer gives the ideal opportunity to introduce some fresh scents into the body care routine, doesn’t it? I like fresh, tropical scents in the shower during the summer months. Even if I’m not going on holiday, the fragrance of something tropical will instantly put me in the summer mood, and this year I’m loving the Mandara Spa Exotic Escape range. A collection of products with coconut, yogurt and almond oils, I knew this was going to be the range for me instantly because anything with coconut screams summer scent! The Shower Gel means you can start the day with 5 minutes in the tropics (if you close your eyes) and the Body Lotion means you can enjoy nourished skin all day too. Summer does mean we need to up our exfoliation game, so the Body Polish is perfect for getting rid of those dead skin cells, especially to keep the skin primed for optimum tanning. Plus all three come in under £6 each – who doesn’t like budget body care when there’s so much to spend on during summer!? We all need an extra helping hand with make-up in the summer don’t we? Our daily staples change somewhat to accommodate the need for more bronzed shades, and more of the summer vibes for lips and eyes. One of my favourite summertime make-up collections this year has been from Clarins. Their Limited Edition Bronze Collection has everything you need for a summer glow and sun kissed look. The Summer Bronzing & Blush Palette has been used daily because it’s the perfect facial bronzer, that applies with a fine powder and settles lightly without budging. The matching Lip Comfort Oils have also been an absolute summer dream – combining nourishment with the non-sticky oil (not gloss) means the lips also look shiny and pretty without sticking. And my favourite is the Mint Shade because the menthol gives a plumping effect instantly – hello fuller looking lips! 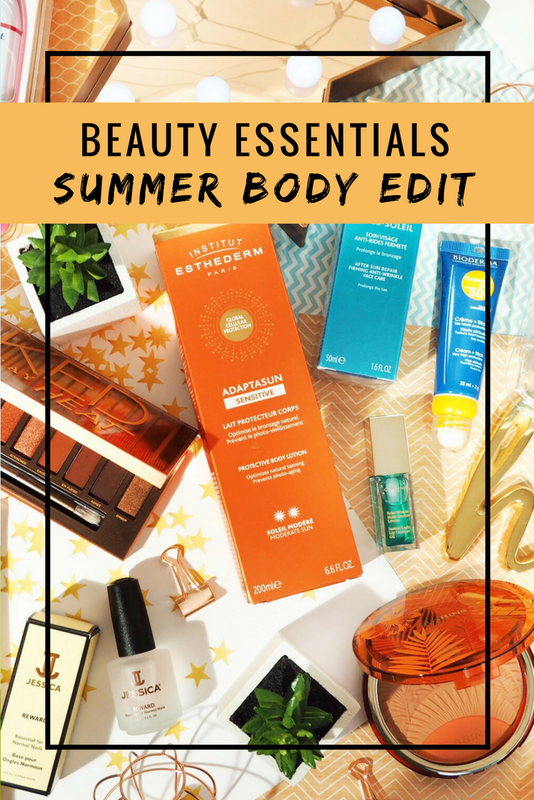 …Summer shades, with the perfect finish, the Clarins Summer Bronze Collection is my choice for the Summer Body Edit. I’m never without my gel nails – I either get them done professionally (my friend has a Nail Salon) or I do them myself. Either way, I feel a bit naked without ma nails. Summer means that we need our nail colours to last longer, chip less and basically survive everything we throw at them, just that little bit better than normal. The Jessica Phenom products have been high on my list of home nail products for ages, no lamp is required, just a slick of their base coat, then the colour, then the top coat and you’re good to go for up to 14 days. I find I get a good 2 weeks of high shine, glossy wear before mine show major signs of needing a re-do. The Dancing Queens set is my perfect recommendation for summer nails – bright, funky colours with an added sparkle in coral, fuchsia and purple. Meaning your nails will be summer ready in no time, likely match the holiday brights we all love to wear, and last longer than normal nail varnish. Footwear in the summer for me consists of flip-flops, sandals and wedges. Oh, and prior to pregnancy, a lot of strappy heels. That means before getting the feet out, I always take the time to use my electric foot file to remove the hard skin from the soles of my feet. Yes, the soles of our feet are a gross area of beauty we often don’t talk about but it’s an essential part of the beauty regime to getting summer body ready. The Scholl Velvet Smooth literally makes the easiest job of something that no-one likes thinking about, or doing, but a few minutes, a few times a week means keeping on top of it. Using Marine Minerals to remove the dead skin cells by gently buffing them away, it’s simple to use and means your feet will not only feel softer and smoother but they’ll look great in all those strappy shoes and flip flops too. Taking care of down there becomes more of a repeat routine in the summer, as keeping on top of things becomes more imperative with the abundance of bikini-wearing. If you’re in-between waxes but still need something to help you keep on top of things, then the Veet Sensitive Precision Beauty Styler is essential because it’s quick and gentle to use. One gadget with 7 different accessories means you can use the Comb Attachment to trim the bikini area, and the Bikini Head to shape it. Perfect for keeping things looking and feeling fresh. Not only for the bikini line, but also for the face and underarms, the other 5 attachments hep to keep on top of any unwanted hair. My previous bikini styler cost me a small fortune and this one costs £23.99 and performs to a better standard, so it’s absolutely worth investing in. A proper summer body essential. I couldn’t write a summer essentials blog post and not include the palette of the hour, the Urban Decay Naked Heat. The warm toned palette with a perfect mix of mattes and shimmers, the shades scream summer eyes and the palette as a whole provides everything you could want for your holidays – as well as just the normal days in the office. I swatched the palette in my Initial Impressions Post before, so you can see close-ups of the shades, and you’ll see that between them, the palette offers the perfect mix of colours for summer. I’m still reaching for mine all the time – I adore this palette. Hair can suffer in the heat and humidity, and that’s without it getting just as scorched as our skin can. So it’s important to find a hair care solution that works for the needs of hair during the summer. The Lee Stafford CoCo LoCo collection is perfect for doing that and it also offers styling products that work for beach waves and summer styles too. Containing Coconut Oil, which works for adding extra moisturisation, it smooths, nourishes and protects against humidity – all in one. Essentials would be Shampoo and Conditioner for daily washes along with the Blow & Go Lotion for styling. I also love the lightweight, but nourishing Hairspray in the range and the Heat Protector. And what’s more is that currently all products in the range are half price at Boots for less than £4 each. Bargain. So that’s pretty much everything for getting summer body ready, and for looking tip-top throughout the warmer months. These beauty essentials will cover you from head-to-toe with everything you need to look and feel great this year. What’s on your Summer Body Essentials list?